1. A General, while arranging his men. who were 6000 in number, in the form of a square, found that there were 71 men left over. How many were arranged in each row ? 16. A shopkeeper sells sugar in such a way that the selling price of 950g of sugar is the same as the cost price of 1 kg of sugar. What is his gain percent? 20. A sells an article to B for Rs. 45.000 losing 10% in the transaction. B sells it to C at a price which would have given a profit of 10% to A. By what per cent does B gain ? 21. The cost price of an article is 80% of its marked price for sale. How much per cent does the tradesman gain after allowing a discount of 12% ? 22. A merchant has announced 25% rebate on prices of ready-male garments at the time of sale. If a purchaser needs to have a rebate of Rs. 400, then how many shirts, each costing Rs. 320. should he purchase ? 24. A reduction of 10% in the price of tea enables a dealer to purchase 25 kg more tea for Rs. 22500. What is the reduced price per kg of tea ? 32. A, B, C are partners in a business. During a particular year. A received one third of the profit, B received one fourth of the profit and C received the remaining Rs. 5000. How much amount of money did A receive ? 38. A sum of money, deposited at some rate per cent per annum of compound Interest, doubles itself in 4 years. In how many years will it become 16 times of itself at the same rate ? 39. What is the difference between the compound interest and simple interest on Rs. 4000 at 5% per annum for 2 years ? 42. Two places A and B are 100 km apart on a highway. One car starts from A and another from B at the same time. If the cars travel in the same direction at a constant speed, they meet in 5 hours. If the cars travel towards each other, they meet in 1 hour. What is the speed of the car running faster ? 47. √7/ √16 + 6√7 – √16 – 6√7 is equal to. 57. then y is equal to. 61. When the price of a toy was increased by 20%, the number of toys sold was decreased by 15%. What was its effect on the total sales of the shop ? 63. A sells an article to B at a gain of 25% B sells it to C at a gain of 20% and C sells it to D at a gain of 10%. If D pays Rs. 330 for it, how much did it cost to A ? 67. A dealer marks his goods 30% above his cost price and then allows 15% discount on it. What is the cost price of an article on which he gains Rs. 84 ? 70. Two numbers are respectively 12 ½ % and 25% more than a third number. The first number is how much per cent of the second number ? 71. Population of a town increases 2.5% annually but is decreased by 0.5% every year due to migration. What will be the percentage of increase in 2 years ? 78. What is the length of the radius of the circum-circle of the equilateral triangle, the length of whose side is 6√3 cm ? 79. If the measures of a diagonal and the area of a rectangle are 25 cm and 168 cm2 respectively, what is the length of the rectangle ? 88. A and B together can complete a piece of work in 12 days and B and C together in 15 days. If A is twice as good a workman as C, then in how many days will B alone complete the same work? 90. The average of two numbers A and B is 20, that of B and C is 19 and of C and A it is 21. What is the value of A ? 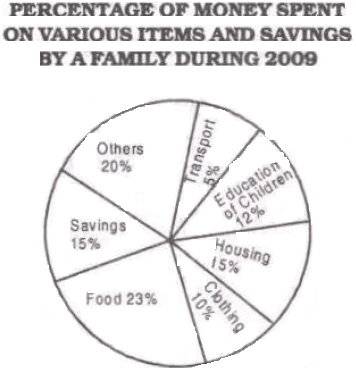 Direction (91-95): The pie chart given below, shows the expenditure on various items and savings of a family during the year 2009. Study the pie chart and answer these questions. Directions (96-100): Study the bar diagram and answer these questions. 96. The number of persons killed in coal mines in 2006 was what per cent of those killed in industrial accidents in that year ? 97. In which year, minimum number of persons were killed in industrial accidents and coal mines together ? 98. 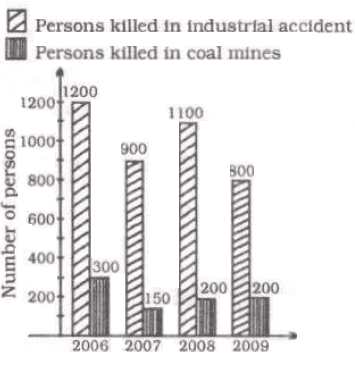 In which year, maximum number of persons were killed in industrial accidents other than those killed in coal mines ? 99. In which year, minimum number of persons were killed in coal mines other than those killed in industrial accidents ? 100. In a year, on average, how many persons were killed in industrial accidents and coal mines together ?